This is old news and is the result of the shaky stock market last December. For a little while, the stock market sent a recession shiver through the housing market. That is over. Since then, bidding wars are back on in Boston. Below 2M in LA is also doing very well. LA South Bay is red hot. The Chinese range and the Chinese money dictates the home prices on the west coast not interest rates or the rigged fraud stock market. Socaljim is a diehard real estate bull. The sky is falling all across the West Coast and he is still looking for silver linings. The classic “houses that people can actually afford are still selling” line is my favorite delusion. My observation is that the market is completely dead over $1.2M all across SoCal. Unemployment is low and there are enough high income households stretching to buy modest shacks but anything luxury is not moving fast. Massive price reductions for luxury homes that are starting to compress values in the mid-tier. This is sidelining buyers and days on market is increasing even in the low and mid tiers. You should take another look … on LA’s westside and the coastal south bay, most SFRs under 1.5M are in escrow. The new ones go quickly. In the beach cities, trying to get a decent SFR for under 2M is very difficult. However, in the valley, above 1M is weak. And in a year they’ll ALL be under water. In two years, people who managed to claw back from the LAST bubble will be underwater AGAIN. This will likely result in an even lower bottom than 2012. But hey, keep throwing good money after bad kids; I’ll wait. 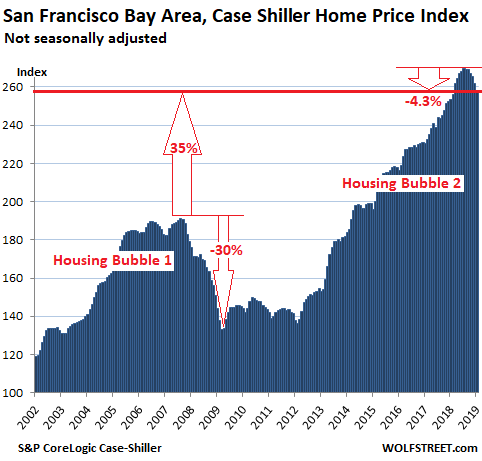 If the Bay area and Seattle go down further in the next CoreLogic Case-Shiller Home Price Index report then you will be wrong. I would say the one after the next one. The housing market did not turn around until mid to late Feb. I guess SocalJim has spoken! Sounds like the market’s just investors buying from investors to sell to investors. We’ll have to see if bidding wars still prevail if mortgage rates go up again. Or maybe things are being fixed so in due time investors will own every piece of real estate in every city. The entire 180 FED U turn within 3 month without any data change means “nothing” and everybody forget about it? For the past 10 years, it is FED ease CAN and WILL drive asset market. Now, it is FED wants to tighten but they CAN NOT, because of what? The FED is NO longer to drive asset prices, the FED ease is because they can NOT tighten. If the fed raises, the entire economy slows into recession and home prices fall. No question about that. As you say, they can not raise because debt levels are too high and the wheels fall off. Then if one realizes this (FED changed from being master to being slaves) , how can the shiver be over? You can NO longer assume FED has got your back because you start to question who whips FED. One interesting bit of data is that corporate profits were down from Q3 to Q4, per the Fed’s Z.1 report. From Q1 2012 to Q4 2018, real corporate profits were up an annualized -1.2% (that’s right, negative), according to the BEA. Meanwhile real stock prices are up an annualized +6.4%. In other words, the stock market is quite richly priced (about 60%) compared to Q2 2012. But that’s only if you are worried about valuations based on profits. Not a lot of investors are. And since the end of Q4, stocks overall are up 12.7%, while the economy seems to be slowing even more, so stocks are even more overpriced. Shiller PEs are not at the incredible excess of the dot com bubble. But about equal to Black Tuesday https://www.multpl.com/shiller-pe Q1 earnings season should be interesting. If “valuation” mattered, we would have been in wealth creation regime.l where economy allocate resources efficiently: We are in wealth transfer regime where everybody just front run each other to receive FED printed paper, so valuation won’t matter until the regime change. As you know “regime change” needs blood on the street, so let’s all pretend and call “gambling” as “investing”, and call “corruption” as “stimulous”, give “them” more power and time and “good things” will be delivered to you in Amazon packages. We have a businessman who favors tariff aggression in the WH now, just like on Black Tuesday. We’ll see how long the stock market continues skyrocketing before it turns 180 degrees to the other direction. 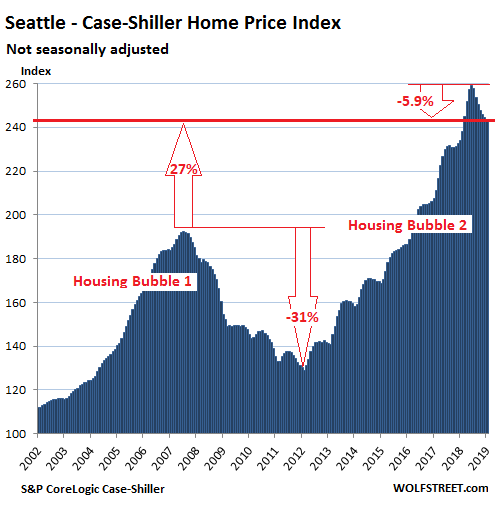 This is true in Seattle as well, listing prices for houses are rocketing higher once again. 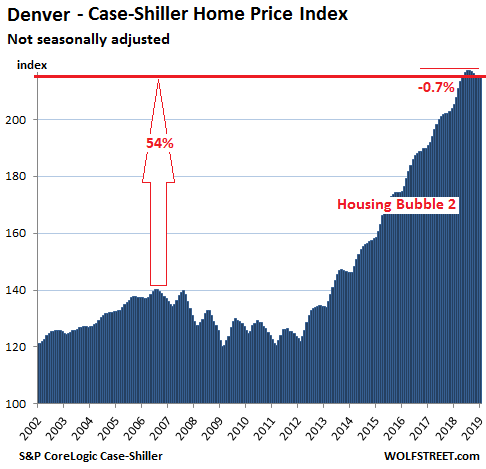 If you don’t believe me go to Zillow and look for yourself – it will depress you. Jerome Powell signaled the end of this rate hike cycle even though FFR never got back above 2.5%, unbelievable, and now mortgage rates are falling and home prices are soaring. Jerome Powell took the cowards path and is following the lead of Bernanke and Yellen, sacrificing the dollar to ensure the world’s ultra wealthy capture more and more of the country’s assets. Your paycheck buys nothing anymore. Bernanke is laughing at us working, rabble from his high paid “position” at Citadel Cap. With house prices running 10X to 20X the typical worker’s annual salary, owning a home is nearly impossible for most first time buyers. You want a place to live? Black Rock will rent you a place… for a price heh heh. We live in a two tier society: the haves (the investor class) and the have not’s (those who earn a paycheck through hard work). you get it, pottersville is what the fed wanted….they like old movies…. I don’t trust Zillow prices anymore, since they started buying houses. In my own area, I am seeing houses that sold less than a year ago, relisted at higher prices. I am also seeing many homes jacked up $100K over what builders are charging. I have no way of knowing if a listing is a Zillow house marked up to unrealistic levels, a fake comp, or if the listing is an unrelated listing. I window shop at Zillow, but would never buy from them now. Rates are indeed crazy low right now. $2 million sfr in LA is selling like hot cake! $2M SFR in LA is selling very well, but only in select areas. Basically, in coastal locations and LA’s westside and south bay. 2M price in inland locations are sluggish with slipping prices. Location is everything … several years ago, everything was hot. A severe recession and collapse of stock markets and real estate is coming. It’s just a matter of when. If you’ve been hearing it for 6 years without seeing it, thats actually a really bad sign given the typical boom bust cycle. LA South Bay is not red hot. The price of tear downs has fallen sharply, indicating that developers have stopped buying them. This is supported by the length of time on market and price cuts. For every available listing in Manhattan Beach, Redondo Beach, and Hermosa beach, another listing is in escrow. That is hot. Facts don’t lie. It does not get much hotter than that. Manhattan Beach, Redondo, and Hermosa are not the only southbay towns. Hawthorne, Gardena, Harbor City, San Pedro, and even Torrance are not nearly as hot right now. Czdrocks: Calling Harbor City and San Pedro “South Bay” is a bit of a stretch, although I know people who aren’t from those places do it frequently. Around here we call them (and Lomita and Wilmington) the “Harbor Area” and they’re very socially and economically distinct from the South Bay. Those cities have always been considered part of the South Bay. I don’t know where you grew up, I grew up in Torrance. I lived in Gardena, Lawndale, and Harbor City. Every single one of those cities is considered the South Bay, and people there consider themselves south bayers as well. To say otherwise is just being an elitest snob conducting some revisionist history. Cdzrocks: lol @ “elitist snob”… calm down bro, I’m from the part of the harbor area where we view people from Torrance as the elite. And no, we’re not the South Bay. Anyway, I doubt anybody here other than you and I cares about this local dispute. I believe that HC and Pedro are horrifically overpriced, but I agree with you that they are not hot. Certainly not red hot. Hi Wolf. The 5-county SF Bay Area (San Francisco, San Mateo, Alameda, Contra Costa, Marin) leaves out nearly 2 million people in the heart of Silicon Valley. Is there data that includes Santa Clara County? Is there any data pertaining to the impact the withdrawal of the Chinese buyers might have on these ( I still call them minor collapses – you might disagree- ) particular markets? There is a lot of talk in the industry about this — because this is a big issue as the condos of entire towers are marketed to investors in China — but I have not yet seen any real data on this. All major US brokerage firms have offices and partnerships in China, marketing US properties in China to investors. This is a big deal for the US real estate industry. And folks are concerned. Big numbers still that continue to skew the market. Wiped out in no time. This is going to get rough and nasty, and you can hear those banks already squealing to pressure the RBA ( reserve bank) to lower interest rates ( doing a Fed move) ! Thanks! Yes, doesn’t look like an ideal situation to me. I feel for renters. They are between a rock and a hard place. Even if the prices in the Bay Area fell by 20% they would be still out of reach for most people. It seems to me that Prop 13 (a California proposition that limits property tax increases to 2% per year) is acting as an anchor, especially for those who bought a long time ago. They may be willing to sell but the math doesn’t support that decision. If you lived in a two million dollar house and only paid $5k-$15k in property taxes it would be very hard for you to sell, pack and move. Unless you decided to move to Kansas. Prop 13 absolutely stops otherwise reasonable transactions in my experience. I practice estate tax planning and have quite a few California clients. The property is worth far more to the current owner than the next. Whenever it comes up, I again wonder whether it causes the CA property tax system to be regressive – i.e. rewarding those with the wealth for long holding periods. So it’s better to not have Prop 13? I think not, unless you sell, escalating property values only benefit state and county governments who quickly reassess values and raise your property tax. Why should the government receive a windfall simply because values go up? The homeowner receives no compensation for this temporary increase in value, yet is stuck paying for the increase. Think about those on fixed incomes being taxed out of their homes simply because the man demands his extra pound of flesh . Only 1 state in the entire country has such a homeowner subsidy as prop 13. You ask why the government should receive such a windfall? Why does the home owner get the windfall. The windfall of not being taxed at the current valuation. Like anywhere else in the country. New property owners pay through the nose here in CA. So why should they be stuck carrying people who just happened to have been born 30 years before they were.? I was in college in San Diego when this passed. The argument the corporations hiding behind the Jarvis Gann initiative that swayed the election was this throwing out old people from their homes. Home prices in America tracked inflation from the end of WW II until the late 70s. 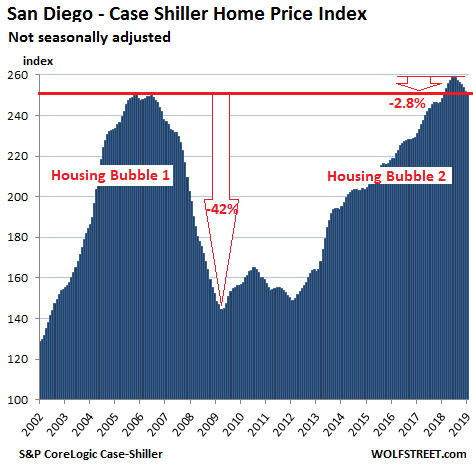 And by a magical coincidence home prices shot up in San Diego just after this passed. In fact, I believe at least, that San Diego was the first city where the average home price was $100k. Anyway, I did not speak with anyone who believed that this would not ultimately gut and destroy the education system in this state. And that certainly proved true. I was lucky enough to have been born at a time when the tuition at SDSU was $105 per semester. CA will ultimately reverse this amendment because it will have to. The real gold mine in Prop 13 was for commercial real estate. They were the interests that funded the campaign while using grandma-taxed-out-of-her-house as the PR sideshow, and everyone fell for it. When Florida implemented similar tax limits they restricted it to residences only. Disneyland pays property tax on something like 5% of the actual present value of the property. And there are dodges like partially selling a property so that it officially doesn’t change hands and doesn’t get revalued. This has major distortionary effects favoring long-standing businesses in the state against new competitors. How do you avold being tax out of your home ? Proposition 13 can be inherited, from parents to children, from grandparents to grandchildren. Good luck to the party that votes to end Prop 13. If you want to see CA turn red that is the way to do it. As soon as the property values drop more than 10% Gavin or whoever is in charge to sign than into law will find out what it’s like to be Gray Davis. That is the 3rd rail in CA politics. And for those seeking to do it with commercial property, if you think business are going to standby and watch their taxes skyrocket you will have a very rude awakening. The business exodus that will pale in comparison to what will happen. I wonder how long it will take to revisit prop 13. The younger generation is totally shafted by it, even if they bought at recent peaks. If it was voted on today it would be really interesting to see the voting demographic by age. Prop 13 is not the only issue, and in fact, seniors (>/=55) can circumvent this problem. (Prop 60 / 90 allow you to bring your lower tax basis to the replacement property if you buy in the same county or buy in one of 10 counties that permit the transfer.) Another restraint is paying a significant amount in capital gains tax on an asset that has appreciated hugely. I know, many people don’t have much sympathy for these folks. But it’s a big reason why people stay put. If these perceived losses did not exist, one might decide to downsize within the same city, but in CA, it often doesn’t make financial sense for an individual family to move. The renters should start pushing to eliminate prop 13. Guess what? Renters pay for property taxes through their rent. Your envy induced suggestion would blow up in renter’s faces. And you must be under the delusion that if a socialist government suddenly received some extra money it wouldn’t spend every last dime of it to buy more votes. And still cry for more. Property taxes passed on to renters? Seriously? Landlords get as much as the market will bear. If they get additional costs and they are already getting market rate how can they ask for more? If renters in this economy are already stretched so thin that they have to borrow to the point where debt levels are soon to break the levee how do you expect them to pay more? They won’t and they can’t. The cost will be absorbed by the property owner. And if this property is not profitable enough he’ll sell. And as for socialism I’d like you to name a single country in this entire world that has not integrated elements of it into their way of life. Here we have Social Security, Medicare, Corporate subsidies (and especially for military contractors of every shape and size) and hell our biggest source of social spending the military itself. And everybody wants these things. Last but not least, I think this whole envy thing says more about you. I think disgust and anger are the key emotions surrounding this issue. 2banana you are very correct, and MarkinSF, I live in the East Bay, my landlord jacked up my rent every 6 months to the tune of $200 each time. It’s insane! In order to continue to jack prices up they put in new crappy plastic framed windows. This “investment” allows them to jack the rent up more. And though the place is falling apart inside, they keep jacking the rent up. I was forced to move into an RV because the rent was going up faster than my income. 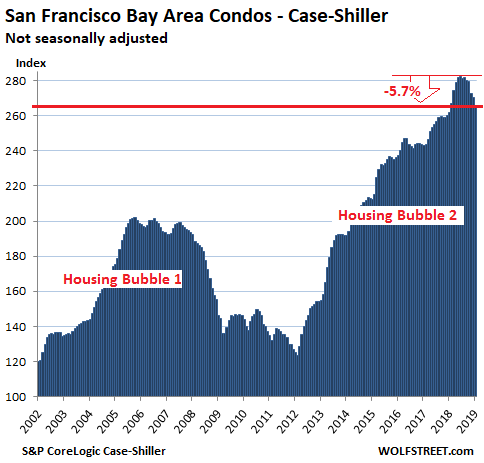 When ALL landlords are doing this, there is no “what the market will bear” at least not in a reasonable sense, this is why a lot of folks are looking to move out of the Bay Area, but have little in savings to do so. Lets also not forget people will do whatever they can to keep a job in a poor economy, (yes, i know the economy is better) including packing 8-10 people in a 2 bedroom apartment. Initially the landlords proclaimed, you want to be where the jobs are? You pay the price. Well now that the jack the rent up as fast as you can mentality has set in it won’t change. And now that there are literally jobs everywhere, do you think the prices will go down, no. Not until people start to abandon CA for the jobs in other parts of the country. I will smile broadly if that ever happens and all the greedy landlords go bankrupt. And in all of this, the states revenue is up by an ungodly mount in reserves, yet they still want more taxes for more programs. I participated in the foster parent program and the amount of money going to useless bodies in this system is egregious. This kid had his own lawyer and an army of support personnel. I can only imagine the cost of all this, was it effective? Nope, it was a huge waste of money. The kids’ remained a complete loser and now is a state dependent. Lets have CA lower property taxes and spend some of that surplus if it wants more social programs. As a CA homeowner (four different Bay Area houses since 1978) I have benefited greatly from Prop 13 and, on my last move, from Prop 60/90. With the obscene increases in real estate value over the years, I would have been taxed out of home ownership if not for Prop 13. Without Prop 60/90, I would not have been able to afford my latest move into a house big enough to accommodate my now three-generation family. CA is a tax-greedy state; it’s nice to have at least one area where they were reined in a little. Prop 13 bashing has always been popular. Not with me. Prop 13 or soaring house prices? Prop 13 only makes sense against a backdrop of persistent vertical house price appreciation, which for many in Cali appears as a law of nature. But could such price gains persist in an environment without prop 13? That this seems like a law of nature tells me that Cali is in a bubble. Could be a 200 year bubble for all I know, but it still is. Nothing can go up forever. What are other root causes? Lack of construction? Would old folk be using their shacks as piggy banks if it weren’t for the security of prop 13? Would they be mobilizing against opening the space for massive new construction if it weren’t for prop 13? How come there is not a deluge of no-risk fat-profit construction if the laws of nature had the price gains baked in? Are the owners entrenched behind prop 13 not the ones to tighten supply so as to bring about the price gains from which they have only to gain at no risk or cost? There is one overripe low hanging fruit here, an incremental step if you will: screwing investors. If you’re not living in it (say, registered address, spends 200+ days per year), then Prop 13 does not apply. If it’s a second property, Prop 13 does not apply and property tax goes up. More so on third property and so on. This way grandpa can still stay, but hoarding is massively discouraged, which is badly needed to open it up for younger folk. Of course, any recipe for helping the next gen by dampening price gains may be experienced as forfeited profits by current owners hedged by prop 13, so we’re likely back to the chicken and egg problem. This is likely how it will play out, if and when Prop 13 is revisited in California. The activists that I’ve heard from have mostly talked about changing it precisely in that way, at least for starters. Prop 13’s defenders will always bring up poor old grandma getting taxed out of the family house, but they’re a lot less vocal in defending the effective subsidization of landlords and people with second “homes.” As well they should be. Seems like low-lying fruit. Prop 13 destroyed California schools. In the Bay Area, where you cannot find a house under $2M, there are only a few decent school districts. But, it is actually Ok to be a renter. We are wealthy but cannot afford a house where we live – $3 million is a stretch. We live in a house zillow claims is valued at $3.5MM and pay less than $7k a month. And in Boston, there are vastly more rental units being built than condos. Why sell the goose that lays the golden eggs when you can get solid gold eggs delivered every month? Continuous construction everywhere. Kendall Square, a bland community of MIT students, tech worker bees, and ridiculous rent extraction dining establishments, has a new tower where 380sf studio apartments go for $2700 a month. The sooner it crashes and burns, the sooner my son will be able to buy a modest house in the burbs where he’s not competing with house flipping cockroach contractors and desperate buyers on a FOMO mission. As a renter who eventually hopes to buy, I do hope it “crashes and burns” in Boston (and surrounding area) but most people (mainly owners) I talk to shake their heads and look at me with pity (er, condescension?) while saying “it’s not going to happen here”. Looking at listings , I see that home prices have doubled in some cases in the last 6 years. So that condo that was 350K in 2013 is now 675K. And rents, as you know, are through the roof. I’m learning to keep my mouth shut because it appears that many people think Boston is immune from a downturn. Will admit I am kicking myself for not buying something years ago because I do wonder lately if it is indeed possible that I have been “priced out forever”. However, being a saver, I am well positioned to buy in the event a correction or crash occurs. Now seems like a crazy time to buy yet I wonder if I’ll be kicking myself harder in another few years. 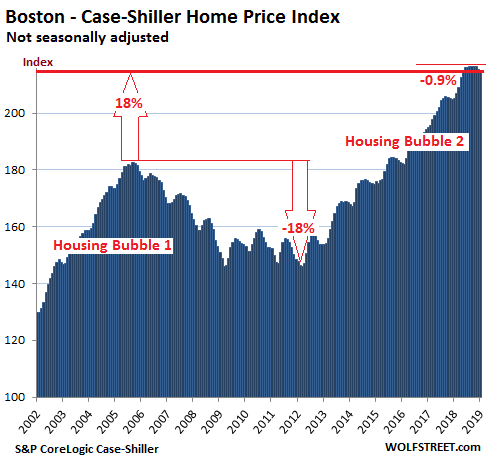 Does Boston area real estate always go up? Time will tell. In today’s (26) Globe and Mail biz section there is a headline proclaiming the strength of Toronto’s economy. The evidence? It has by far the most construction cranes at work in North America. At over 100, it has almost double the largest number in the US, Seattle’s at 59. In fact TO is employing 25% of ALL high- rise cranes in NA. This IS a big city but the country has one tenth the pop of the US. but there aren’t lots of empty fields. These sites could not have been cheap. Ironically, the writer of the piece seems unaware that this level of frantic activity is a text- book, cliche warning of an impending flooded market. You have to wonder, when these projects were committed to, 1 to 3 years ago, how many players knew there would be all these other players? PS; Don’t enter Globe to read it, you hit their wall. If you enter Toronto Cranes a few entries in someone else has it but the gist is in my comment. Toronto is also undergoing one of the largest mass transit projects on the continent. The fact is, Toronto is a world unto itself. Nicko2, you really need to put down the pom poms. As a fellow Canuck, I find your constant cheerleading of everything going on in Canada embarrassing. We have some serious issues up here, including housing and construction bubbles, and massive amounts of household debt. We need to recognize these things and prepare for the fallout, not cheer on the excess. How’s that Calgary condo of yours doing? Do you still own the only place in all of Alberta that’s going up in price? Don’t worry, As soon as the WeWork and Lyft IPO’s happen the bay area will be flooded with money from all the newly rich stockholders and employees and house prices will once again boom to the sky as they rush to buy real estate before they are priced out of the market. The massive future profitability of these great companies will cause the share prices to soar so that the size of the loans the insiders have been able to get in exchange for pledging their options will seem like peanuts compared to what is on the horizon. It has been reiterated multiple times on this site that the IPOs will likely have little bearing on the real estate market because the stockholders already mostly used their privately held positions as collateral or liquid assets to make their purchases. You might want to read my post a bit more carefully. My intent was to incorporate the previous article about the abysmal profitability of WeWork in to a parody post to poke fun at the “real estate pumpers” that often comment here. Ah did not catch the satire, apologies. These days satire and mainstream media reporting are indistinguishable. Except the satire is better researched and better written. I didn’t catch “poke fun” part either though I thought you might have been sarcastic. Now I can see it clearly. Thanks for clarifying. Those shares have been worth a lot of money for a long time, and they can be sold and have been sold, and they’re being used as collateral, and these millionaires and billionaires don’t have to wait for an IPO. They already got part of the money and already bought expensive homes, which is in part what caused this run-up in prices. Do you think the Uber billionaires and millionaires are renting a dumpy apartment until they finally can sell their shares post-IPO in the open market and buy a big home? This is one of the biggest hype projects around. A more likely scenario is the IPO’s flop and they take down Silicon Valley. My house is still underwater from 2005 in Phoenix, so meh. But I still don’t care, still need a roof over my head. I am pretty sure that the crash will come from the new tech unicorn wrecks. 3-6-3 world, with no end until wages outgrow capital for years. If prices keep dropping you’ll soon see buildings going up in flames for the insurance money. Especially if there’s an earthquake, just to make it look good. We know this because it’s happened before. This represents an opportunity to short insurance stocks. Having lived and purchased homes in both California and Texas, it’s my believe that resource is the driving force behind policy. From it’s geography advantage as an import/export gateway, its mild coastal climate for tourism and crops, to an entrenched high tech sector, California voters can afford the excesses of socialist policies that would have bankrupt any landlocked state. That said California has been bleeding corporate moves, from an unfriendly business environment, for some time and it would have been worse if not for Prop 13, a hedge to retain some businesses although at the expense or benefit of tax payers – depending on how you see it. By focusing on these location-dependent sectors, California doesn’t have to compete with other states. In contrast, Texas has been courting and absorbing corporate headquarters leaving California, with significantly lower cost of living and through tax incentives – just not highly publized PR disasters like Amazons HQ2. And it’s been a booming growing on housing. Downtown is constantly marred by construction traffic, whole skyscraper neighborhoods are popping along major corridors. Home and condo builders are having a feast. 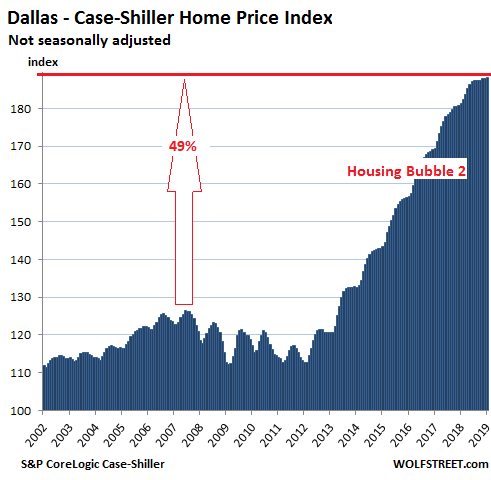 Yet the Dallas suburbs resale housing market has hit a ceiling despite rising income. Unlike costal California developments, there is almost an endless supply of land around Dallas. For the most part of 2018, SFR listings would sit on the MLS for several months, get taken down, relisted again and again. Though in February 2019, all of a sudden, about 90% of them were sold. I am sure Dallas, Downtown or suburbs buyers were waiting for the interest rate to drop. Meanwhile I have also been tracking a Long Beach, California neighborhood, where I have a rental SFR in Belmont Shore/Heights, in the $1-$1.5mil range which were moving steadily for the past two years. In these older California costal neighborhoods of customized lots and houses, any reasonably priced SFR won’t last more than 30 days on the market while some listings, with “lot or location defects” or outrageous asking prices, would sit on the market forever. I think California buyers have more equity (old money… may be Chinese cash) as oppose to younger Dallas professionals with a high paying job who are more reliant on a mortgage. Tales of two very different housing market scenarios. And these cities actually have jobs that can support those prices. 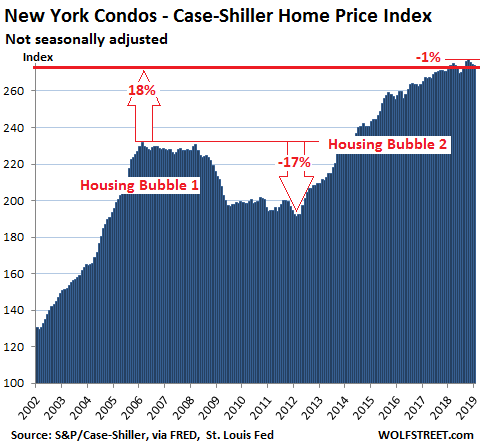 The Bubble is deflating much faster in areas overbuilt with Boomer McMansions. Southern Florida, Scottsdale, Greater Atlanta, etc. It’s like Neuschwanstein had litters. 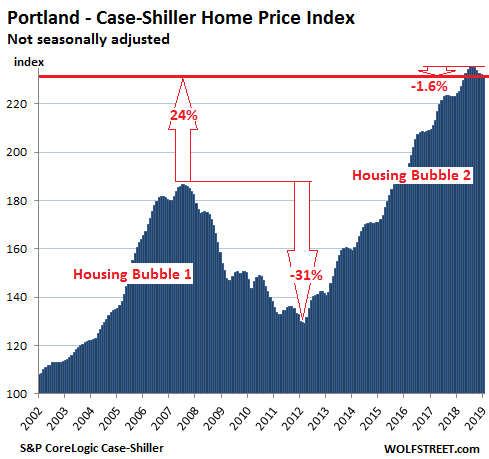 The general trend in transactions is also important to note as a drop in transactions generally portends a drop in prices per this chart of 20 city case Shiller data. Honestly, I don’t see any impact on the ground in San Diego. I understanding Housing takes long time to turn in either direction so looks like the trend would become clearer in next 6 months or so. Interesting. I believe you (it makes sense) but I would love to read about this. Could you point me in the appropriate direction, perhaps even with a linksy? This is not where the next financial crisis will be. Yes prices have peaked and will retreat some (maybe 10%), but we will not see any type of crash. I’m afraid that there will be no big crash again like 2008/09 for some time, barring of course a black swan event like serious war, a nuclear detonation, etc. That is not to say things will get better; they won’t. We are in a slow downward spiral throughout the world. Various factors at play – productivity, energy, climate change, demographics…..I could go on. Bottom line for me is buy where you want and can afford to live and forget about it. If you can’t afford to buy (yet), scrimp and save and get into something small to start with. Renting long term is not desirable, unless your lifestyle moves you around a lot. Wait, If we are in a slow downward spiral explain why owning is better than renting? By definition, in a slow downward spiral your real estate investment will not appreciate, therefore it becomes a simple monthly cost to rent vs monthly cost to buy ( plus taxes, insurance, maintenance etc.). So the only way in such an environment it is better to own is if rents are high in relation to real estate prices. If I can rent a 3 bedroom home cheaper than all the costs of buying that house, I can save the difference and buy the house ten years from now when it is cheaper, I also have less risk of getting stuck with a home in an area where the schools fall apart, or the economy is hollowed out. 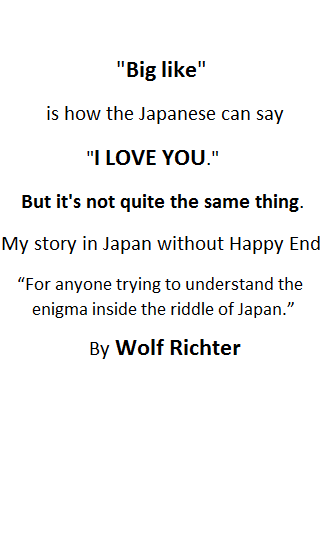 This is not an imaginary situation as it is one that Japan has been in since the 1990’s and is as you describe a likely one for us. I don’t see any reason to buy one to own rather than rent. 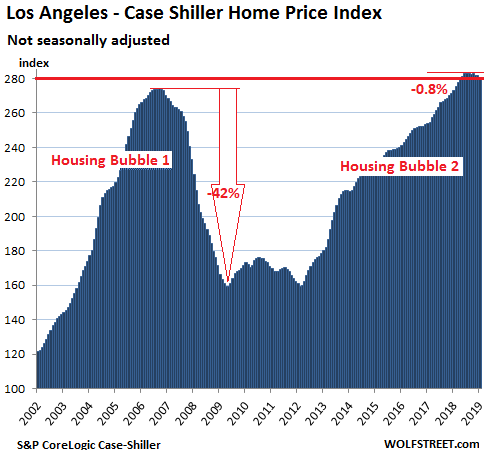 Every time I hear “this time is different” and especially in Southern Calif, we have witnessed many boom and bust cycles. I also believe we are in a slow downward spiral simply because I see folks working so much harder to keep treading water. Another indicator is housing alternatives. For example, fellow poster Vanbytheriver has a good job in Seattle yet lives in a van because he will not pay the inflated Seattle rents. I live in a rural area on Vancouver Island that is becoming gentrified. I noticed the other day the local failing trailer park is filling up. I also see people living in RVs, (which are definitely NOT constructed for winter comfort). I see poor young males driving electric scooters and even bicycles with attached gas engines…not often, but they are heading to the local store the only way they can. My friend used to own the local resort with the attached camping store. He tells me the destitute always shop there, sometimes daily while people “with means” drive to town for groceries. Those are just a few clues that people might miss in a more vibrant/busy suburb, but if you look closely, I am sure they are there. These situations do not show up in the stats, and neither does doubling up or couch surfing. This is true and I believe it is the current correct approach, especially in a place like Seattle eastside where buying is clearly more expensive than renting. However, it isn’t a slam dunk. Unless there is a crash the equalization period (even with higher st. deduction, closing costs, appreciation of down payments, etc) is still only 5 years or so. It really comes down, as always, to each person’s situation. I’d buy, even today, in Seattle’s eastside if I knew I’d be here for 7 years. When you buy you get a shelter and an investment. When you rent you only get the shelter. Basic wisdom was always better to own than rent. Don’t know what has changed that wisdom. When you buy you get a shelter and an investment, which means that you get investment risk. When prices drop enough, expect inventories to pile up as owners on the fence unload as close to the top as possible. Then buyers will be reluctant to cough up their life savings for a down payment on a depreciating asset in a deflationary market. Sounds like we need another round of tax cuts for billionaires. These numbers are useless. Manhattan is already down 15%. This down-turn in real estate prices is giving me visions of Major Kong straddled on the big one, just as the bomb bay doors finally open. This data is 3 months old. 3 months ago mortgages were about 1% higher than today. Which means 3 months ago might as well have been 3 years or 30 years ago, it’s an entirely new paradigm, at least short term. This is only true if mortgage rates are the primary determining factor in home purchase decisions, which is not (surprisingly!) supported by the data. Particularly on the time frames we are discussing here. Sometimes it has been true in the past… but several others times it has not. If the market is supply driven then the downturn will continue… if rate bound the market will pop. I have observed a very crisp pick up in buyer activity in the Seattle market. I began tracking new 3 bedroom condo listings in Seattle ($500k-700k) since mid February. It seems like there was a sudden surge in buyer interest since the beginning of this month. A quiteimpressive surge and it caught me off guard a little, eventhough it is usually a seasonally strong time of year for RE transactions and interest rates had been dropping for several weeks PLUS the S&P 500 had the best start since 1991. No idea if this means higher highs later this year in Seattle or if it was just one heck of a dead cat bounce. Too early to tell. What most don’t get is this: We’re doomed. I’m going to post an article on the mortgage lending industry shortly. There are interesting (not good) things going on for mortgage lenders. Just got some data from the MBA. It won’t be a direct answer to your question, but it will shed some light on it from a different angle. Will likely be up later today or early tomorrow. Are the graphs inflation adjusted? 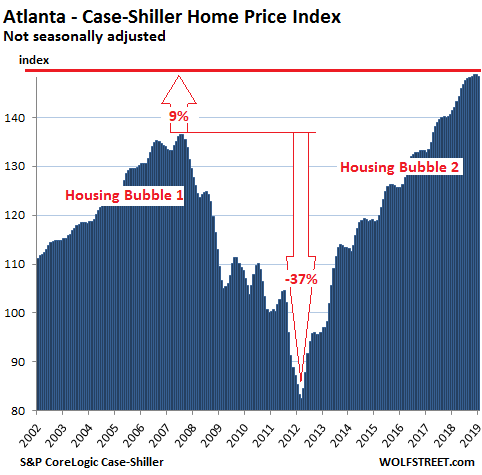 As I said in the article, these charts ARE measures of inflation, namely home price inflation, since they compare the sales price of the same house over time. This is the best measure we have of home price inflation — or of the loss of purchasing power of the dollar with regards to home prices. So you can use this measure of inflation and adjust wages for it: “real” wages adjusted for home price inflation (instead of CPI). Don’t laugh. This is a big issue where home price inflation has outrun wage inflation, which is in all the markets on this list. I left the SF peninsula (Santa Clara cty) a couple years ago, but still check condo prices for the zip I used to live in. Looks like 2br are down to about 2016 levels, with 1br fairing a bit better. There are some outliers, but those seem to be extensive/comprehensive remodels of older units. Spend 75 to 100k, and get a little bit more on the backend at sale. My biggest worry would be the reliance on stock and bonuses, and how far some stretch to buy. I know when I lived there my expenses exceeded my paycheck, but stock/bonuses kept it livable. That was not extravagant living, just a small condo, 2 kids, and two old, but paid for cars. I ended up leaving because I needed more space to keep my sanity, and didn’t feel comfortable paying 300k more for 1 more bedroom and 150 additional square feet. The Fed Backing off a tiny bit more on interest-rate increases and its balance-sheet rolloff, as the Fed did, instantly caused a yield-curve inversion, the biggest and most reliable recession indicator (or cause) there is. That’s because an inversion of the yield curve pushes banks away from making mortgages and other kinds of loans. That leads into recession because available credit starts to dry up, causing its own tightening of the economy, for credit is the slack we run with. Wolf you said you will put Chicago market. I’m curious as I do not see a bubble there because the market is still recovering from the 1st bubble. Also, there was not mass migration of people and investors to skyrocket the demand and raise the prices like the cities you listed.